All 67 games of the 2015 NCAA Division I men’s basketball tournament will be available to stream over the redesigned March Madness Live App. NCAA Digital, CBS Sports and Turner Sports launched a GameCenter fan experience that includes a new Capital One NCAA® Tournament Run game. The Sports Techie blog readers and followers in Atlanta, across the U.S. and around the world are in for a sports technology treat with new app features that include better navigation, a more streamlined layout and fan-centric sections downloadable at the Amazon and Apple App Store, Google Play and Windows Store. Robust TV Everywhere Offering Provides Fans With Exclusive Live Video Streaming Through Entire Tournament . Because of a combined average of 10.5 million March Madness viewers across CBS, TNT, TBS and TruTV, the going rate for a 30-second ad on CBS right now is more than $1.5 million, says Anthony Crupi, Ad Adage. An engineering and operational redesign of March Madness Live became a sports tech necessity in order to meet this perfect storm of an event for CBS, tournament partners and sponsors, and all the digitally savvy fans. Gamecenter was created to fill the fan experience need with more content. Gamecasts enters its second year as a sports technology product so look for more Turner Sports marketing campaigns to help brand these innovative concepts in the coming days. Mark down Thursday, March 12 on your digital device calendar as the day March Madness Live is ready for download over the CBS Sports App and Team Stream by Bleacher Report as well as websites ncaa.com/marchmadness, CBSSports.com and BleacherReport.com. March Madness Live for the Apple iPhone and iPad. — “Teams” Section – The new teams section allows fans to follow their favorite team throughout the tournament with stats, video content, a season recap/snapshot, team roster and information outlining upcoming tournament match-ups. — “Featured” Section – For the first time, fans will be able to view content that captures the story lines classic tournament moments, match-up analysis, top plays, press conference coverage, featured video content and more. — GameCenter – The epicenter of NCAA March Madness Live has been reengineered to give fans more ways to watch live games on smartphones – allowing video viewing in both portrait and landscape orientations. In addition, companion content on smartphones and tablets, such as team and player stats and social content from the Coke Zero NCAA March Madness Social Arena, is more dynamic and more discoverable than ever before. — Capital One NCAA March Madness Bracket Challenge – This year, the official bracket game of March Madness – available via desktop, smartphones and tablets – is upgrading with new game features and more tools to help fans make their bracket picks. In addition, this is the only bracket game to integrate access to the live video stream of every match-up during the tournament. NCAA® March Madness® Live™ to Present All 67 Games of the 2015 NCAA Division I Men’s Basketball Championship Across Digital Platforms. The TV Everywhere initiative has impacted the industry enabling pay-tv subscribers unlimited live streaming tournament coverage across online, mobile and tablet screens. If you have not cut the cable cord or have a Sling TV bundle that includes TNT and TBS but not TruTV, log in with the required TV service provider data. CBS still provides all games they broadcast for free requiring no registration. Take advantage of the temporary preview period of NCAA March Madness Live before a login is required or use the seven day Sling TV trial if you do not want to pay. For those on the go or in need of a primary or secondary live streaming digital platform, use TNT, TBS and TruTV, or a participating TV provider. This is year five that Sports Techie hoops fans can watch live coverage of all 67 tournament games over national television networks at CBS, TBS, TNT and TruTV, in addition to streaming over the NCAA March Madness Live app. For the second year in a row, the Final Four telecast is on TBS. The National Championship will be shown on CBS for an amazing 34th consecutive year on Monday, April 6. The college basketball sports tech revolution is being pushed to another level by the partnership between the NCAA, Turner Sports and CBS Sports, They produced a team-specific element for the Final Four national semifinal game participants in Indianapolis on April 4, meaning each of the four teams will have a special telecast fans can watch, two on TNT and the other two on TruTV. If you want to see and hear a broadcast tailored specifically for each universities loyal fandom, complete with different announcers and a variety of viewing options, this is your kind of innovative event and sports technology invention. NCAA March Madness Live will stream three unique live video streams of both semifinal games. Fans can use the app as a first or second screen and enjoy traditional delivery of game content via the TBS live coverage while team-specific video is available on TNT and TruTV. The upgraded March Madness Live app has “excitement” alerts that let you know when high impact tournament moments occur, it has real-time live scoring and updated official brackets. 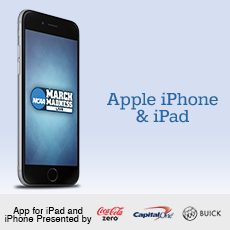 App users can get favorite school specific game alerts, fun and lively Coke Zero NCAA March Madness Social Arena content and use the job saver Boss Button presented by Buick for hungry fans watching at work. Each digital product also has a personal channel lineup feature and live radio broadcast access brought to you by Westwood One for all games. 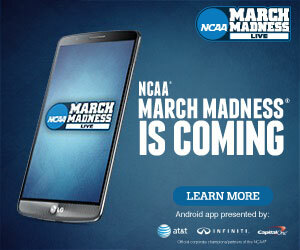 Co-presenting sponsors for NCAA March Madness Live are NCAA Corporate Champions AT&T, Capital One and Coke Zero. 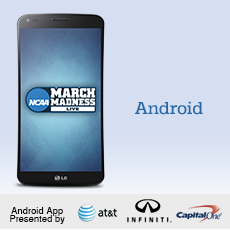 Buick, Capital One and Coke Zero sponsor the NCAA March Madness Live App for iPhone and iPad, while AT&T, Capital One and Infiniti are sponsors for the Android app. AT&T is presenting sponsor for Windows app. Buick, Infiniti and LG Electronics are NCAA Corporate Partners. Robust TV Everywhere Offering Provides Fans With Exclusive Live Video Streaming Through Entire Tournament. Sports Techie, get ready for Selection Sunday by downloading March Madness Live on your smartphone, tablet and kindle to start the Big Dance off right. Tournament Run is a good idea. I am curious as to what the questions will be and how many will center on big data, statistics and analytics. A few days ago the new NCAA March Madness YouTube channel was launched you can read more about in our #SportsTechie blog at this link. The archived video selections are compelling but not enabling embedding of March Madness videos might be a decision the channel will want to change in the near future. I understand the concept of directing fans to official videos only available on the channel but reality is the more viewers Turner, CBS Sports and the NCAA can generate via embedded shares across millions of digital devices, the better it is for sponsors reach and fans who do not frequent YouTube. Ad Adage reports that 69.7 million live video streams tuned into this American sporting and entertainment classic last March, a massive number to behold. These metrics will continue to grow as more and more fans get online with new digital products in order to watch their favorite schools, players and coaches, underdogs and favored teams, go at it each game until the last second runs off the clock. One Shining Moment is an awesome CBS tradition that honors the best visuals of March Madness. With the vast array of digital services delivering countless shining moments over CBS, TBS, TNT, TruTV and March Madness Live over 67 games times the new song title I recommend is, Epic Shining Moments. Be aware that bracketology fever is a real deal that is soon to sweep the nation just like Gamecasts during the Final Four. Play CBS Sports Bracket Sports here.